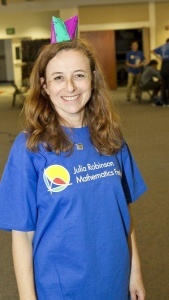 Last week the first ever Julia Robinson Mathematics Festiva l was held in San Diego. What a great event celebrating the joy of math in a non-competitive atmosphere. About 70 students, mostly from grades 6-8, were in attendance. My favorite part was watching kids be comfortable enough to admit what they don’t remember, and figure it out right there. It was also great to see kids (and adults!) get really silly with math. Activities included a engaging recreational problems from many different areas of mathematics. You can see them in the San Diego Union Tribune gallery. We were honored to host a table with Geometiles. 3 common classroom challenges and suggestions for handling themIs Geometry the Unsung Hero of Mathematics Instruction?